Growing up on a ranch in the foothills of the Rocky Mountain Range, I had a dog...actually I had quite a few dogs over the years before I moved to the city. But this dog was special. He saved my life when I was a child. I fell in a stream, and he pulled me out, and then went and got my folks before I froze to death. This dog had a nice collar. Full grain leather, solid brass hardware. A working collar for a working dog. Fast forward 20 years. I got another dog. So I needed another collar. A collar like the one I used to have. So I went to a pet store. I couldn't find a good collar. Chrome, plastic, and nylon everywhere. The few leather collars were low quality. So I figured I would try a feed store. Same thing. 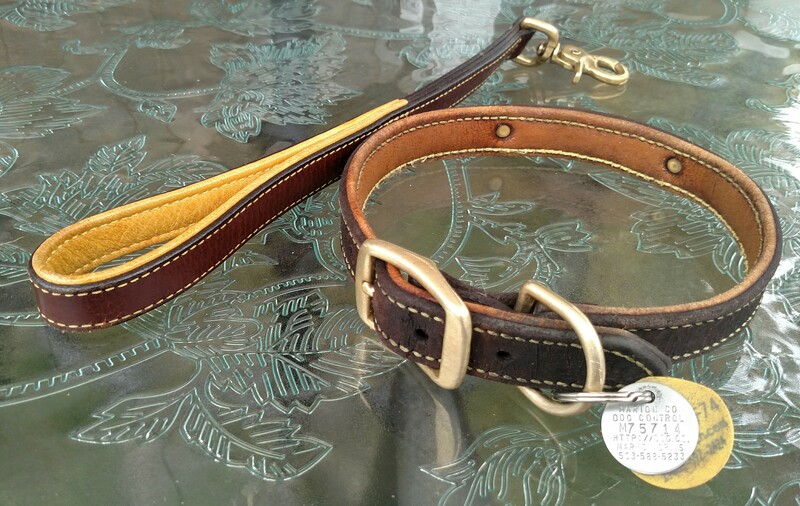 Looked at the halters and other horse tack and saw those were good quality, but the leather dog collars were not. The search continued. Surely someone made an off the shelf dog collar that would bring back memories of bygone days when a boy and his dog would go on adventures? My criteria was simple. Full grain vegetable tanned leather and brass hardware. Two D rings. One for the tags, and one for a leash. (And I wanted a matching leash). Edit: I never did get those two D rings on a collar. Custom made collar and leash was going to cost me about $300. I was willing to pay, but the wait time was about a year and a half. I needed a collar now. Then I found Tasman's Natural Pet Co. and let me tell you, they spun a nice story. I'm going to paraphrase thier description because they are a bit "wordy." They make stuff for thier equestrian customers (horse folks). They decided to make stuff for dog folks too. So they took Bridle vegetable tanned Bison and backed it with American Elk. They then stitched it together and used brass hardware. So it's got the durability of Bison (American buffalo) on the outside, which is pretty durable stuff. Rhino and elephant leather is tougher, but that's about it. Elk leather is mostly used in gloves, owing to it's softness. The most expensive bridle collar is $27.50. That's cheaper than most of the chinese made collars I saw at the feed store or pet shop. Having one custom made in those materials would cost me over $300. At the time, I think his collar and matching five foot leash cost me a little over $50...but that was eight years ago. Thier prices have gone up some. Shown is a matching traffic lead, which I purchased several years ago. The collar is eight years old and looks it. So, if anyone wants a high quality dog collar at a good price, I highly recommend Tasman's. I just purchased another collar and lead for my second dog. Black and pink this time. Nickel plated brass. Girl dog. Smaller collar and thinner lead, because she weighs half as much. Total plus shipping was $70.95. As I said, their prices have gone up some, but they are still competitive with "top tier" collars and leashes found at pet stores, and much higher quality. Here's your chance to help support TSD, and feed your ADs! 1. Go to the TSD Donation page here. 2. Change the quantity to 5 for each ticket you'd like to purchase. Simple as that. $5.00 to enter this raffle! This is open to our international members too, unless otherwise noted per prize. The deadline for entries is midnight EST Saturday, May 26th, 2018. Winners choose which prize they want, in the order their number is drawn. Yes, this may take several days. Patience is appreciated. Prize must be claimed within 24 hours. If you don't claim your prize within 24 hours, you will still receive a prize. You'll just lose your place in picking your prize. Winners will need to private message the prize donor their full shipping info, including name. with case and instruction manual. currently weighing in at 3 lbs 12 ozs. I'm going to stuff it as full as possible though, and it isn't full yet. Moon Soaps - Old School - Synthetic and More!